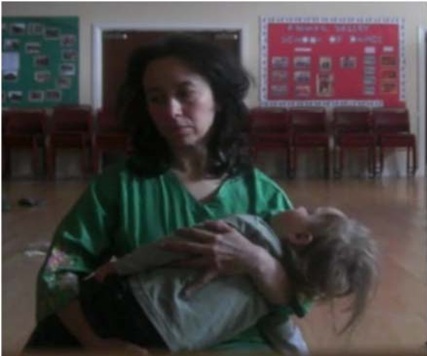 The mother is holding the performance space and her child within it and through this deconstructing the dimensions of conscious performance. This work presents a kinaesthetic relationship between mother and son, as he grows from baby to toddler. It presents intimate and detailed performances of their sensing of reality. The dynamic of presence moves from everyday interactions to abstract movement. Authenticity is a thread through the process, from the ‘filming by the filmed’, simply pressing the on and off button, to the durational nature of the ‘anthropological’ like encounters. The toddler falls asleep after a tantrum, the two figures go in and out of shot, and sounds are heard from the baby out of view. The artist uses ‘Authentic Movement’ technique as a launching pad for situational happenings. This facilitates the subject of the pre-spoken/written language experiencing of the baby and his environment. The accompanying drawings are by Isaac made at the same ages as the films give a window into his perception of time and space as well as his motor skills at the time.